Using the London Underground can be trying at the best of times – it’s busy, hot and noisy. Some stations service many lines on numerous platforms, so it’s easy to get lost even if you’re a seasoned Tube user. The task becomes more daunting if you have a vision impairment. In 2014, the RLSB's Youth Forum challenged ustwo, a digital design studio, to help them address the challenge of independent navigation on the London Underground. Fast forward 18 months and this collaboration has grown into Wayfindr, a joint venture between the Royal London Society for Blind People and ustwo. The aim of this venture is to empower vision impaired people across the world to navigate independently through their environment, be it train stations, shopping centres or hospitals, for example. To do this, Wayfindr is setting the first open standard for audio navigation, feeding into digital navigation services and the built environment. With limited or no vision, navigating an unfamiliar environment means you are wholly reliant on auditory cues or a sighted guide for directions. Emerging technologies such as smartphones and Bluetooth Low Energy (BLE) Beacons could be the future of independent navigation for blind people, but a current barrier is the lack of consistency. Sharing the insights from their live trials, Wayfindr provides built environment owners and digital navigation services with the guidance they need to open up their venues and services to vision impaired people. The guidelines are validated by testing with real users, in real settings, making real time adjustments to the Wayfindr Standard and accompanying prototype app. The current trial at London Euston uses a smartphone application that guides blind users with spoken instructions, which they listen to on headphones. The system uses Bluetooth beacons around the station, the location of the user’s phone and relay the relevant message, such as ‘Turn left and walk down the stairs – there are nine steps’. As the user progresses through the station to the next beacon, the next message is delivered. The vocal prompts are sparse enough not to be confusing, but regular enough to reassure the user that they are on the right track – for example in longer corridors there might be a message saying ‘you are halfway down the corridor’ to let the user know that they haven’t taken a wrong turn. 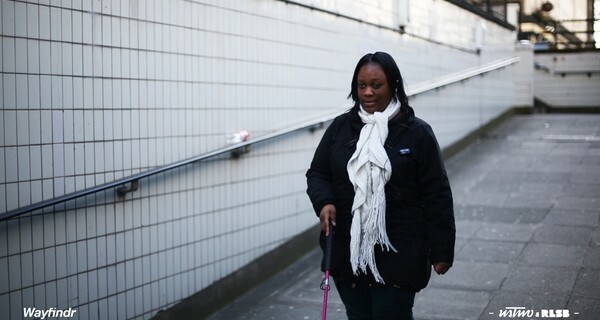 Wayfindr was a semi-finalist for the Nesta Inclusive Technology Prize 2015. It has also received support from Google.org and Comic Relief's Tech for Good Programme. To support this project or to receive updates on the team’s work, visit their website www.wayfindr.net – they would be delighted to hear from you.